Tickle My Senses: Mangalore Style Hot Pepper Chicken. 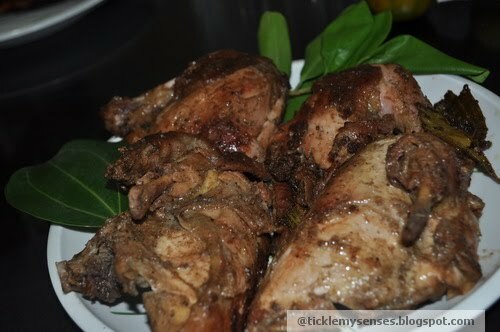 This is a simple hot dry chicken recipe I learned from my Mom . The chicken cooked with a few simple everyday ingredients is really hot, tasty and succulent. This treat goes well as starters alongside a hearty peg or as a main meal with potato wedges and a fresh salad with yoghurt. 1 whole chicken cut into large pieces. 1. Clean the chicken well and cut into large pieces. Remove excess water. Make slits all along the fleshy portions of chicken, using a knife to allow marinade to penetrate the meat. Apply salt and lemon juice all over the meat. Leave aside for 10 mins. 2. Meanwhile grind all the masala ingredients together to a fine paste. Add curds and lemon juice. Taste for sufficient salt. 3. 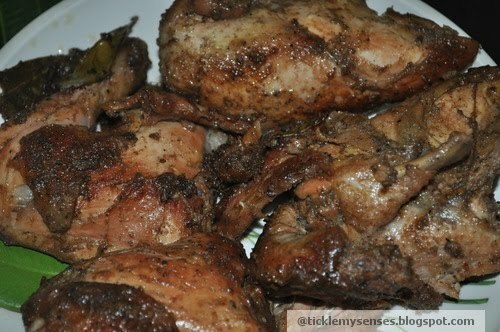 Apply marinade all over chicken, leave for atleast 1-2hours. 4. Heat 3 tbsps of oil in a large non-stick pan. When hot place the chicken pieces carefully. Once the meat has browned on one side turn upside down to brown other side say 10 minutes on each side, add a cup of water, close the pan with a lid and cook on a medium heat for another 15-20 minutes till done. Add more water if required to cook chicken. 5. Once the chicken is cooked leave the pan open and allow the gravy to dry up and thicken sufficiently enough to coat the chicken pieces. Let the chicken rest for a few minutes before serving.